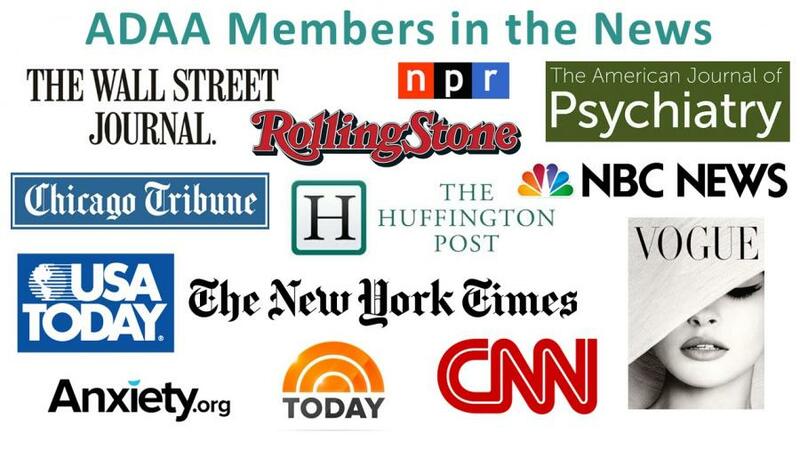 Many of ADAA's more than 1,800 members are interviewed or featured in newspaper, magazine and online news channels. We list all ADAA members who appear in the news below. Are you an ADAA member who has recently been cited or featured in a news article? Have you authored a recent news story? Please let us know and we can share the media item here and through ADAA's social media platforms. Member names are listed after the name of the media publication. For all media inquiries please contact Lise Bram. For a complete listing of association-wide ADAA news mentions please click here. 05/07/2018 Intensive PTSD Treatment Shows Success Among Post-9/11 Warriors, BBRFoundation.org, Mark Pollack, MD, Barbara Rothbaum, PhD, Naomi Simon, MD, MSc, and Alyson K. Zalta, PhD. 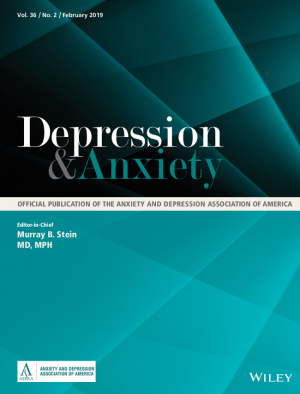 01/19/2018 The Comorbidity of Anxiety and Depression, NAMI.org, Beth Salcedo, MD. 12/05/2017 How to Talk to Kids about Fears & Phobias, Andrea Umbach, Psy.D. 11/13/2017 Why Anxiety Is Especially Difficult for a Woman, Livestrong.com, Karen Cassiday PhD. November 2017 Trends report: Technology is Revolutionizing Practice, APA.org, Mary Alvord, PhD. October 2017 What Is Psychological First Aid? We Need To Implement It After Traumatic Events Like Mass Shootings, Bustle.com, Lata McGinn, PhD. October 2017 What is Anxiety?, Anxiety.org, Tanja Jovanovic, Ph.D. Consulting Editor, Abigail Powers Lott, Ph.D., Vasiliki Michopoulos, Ph.D. , Jennifer Stevens, Ph.D., Sanne van Rooij, Ph.D., Sierra Carter, Ph.D., Jessica Maples Keller, Ph.D., Yvonne Ogbonmwan, Ph.D. , Anaïs Stenson, Ph.D.
10/06/2017 How To Approach Anxiety with Cleverness - Part 2, PsychologyToday.com, Reid Wilson, PhD. 10/03/2017 The Psychological Ripple Effects of Mass Shootings, Billmoyers.com, Sheila Rauch, PhD. 09/20/2017 Online Therapy an Option for People Seeking Relief From Mental Illness, MPRnews.org, Karen Cassiday, PhD. 09/11/2017 Can Online Mental Health Therapy Aid Workers and Curb Costs?, MPRnews.org, Karen Cassiday, PhD. 09/09/2017 For Teens Knee-Deep In Negativity, Reframing Thoughts Can Help, NPR.org, Mary Alvord, PhD. 09/07/2017 25 years after Andrew, anxiety rises as powerful Hurricane Irma approaches Miami, Miami Herald, Charles Nemeroff, PhD. 09/05/2017 The psychology of grassroots advocacy and sustaining a movement, Bloomberg Government, Mary Alvord, PhD. 09/04/2017 Surprising Insights About Anxiety, PsychToday, Debra Kissen, PhD., M.H.S.A, Emily Bilek, PhD., Helen Odessky, PsyD. 08/22/2017 How to Talk About Social Anxiety at Any Age, Boomdash.com, Debra Kissen, Ph.D.
Visit our ADAA in the News page.